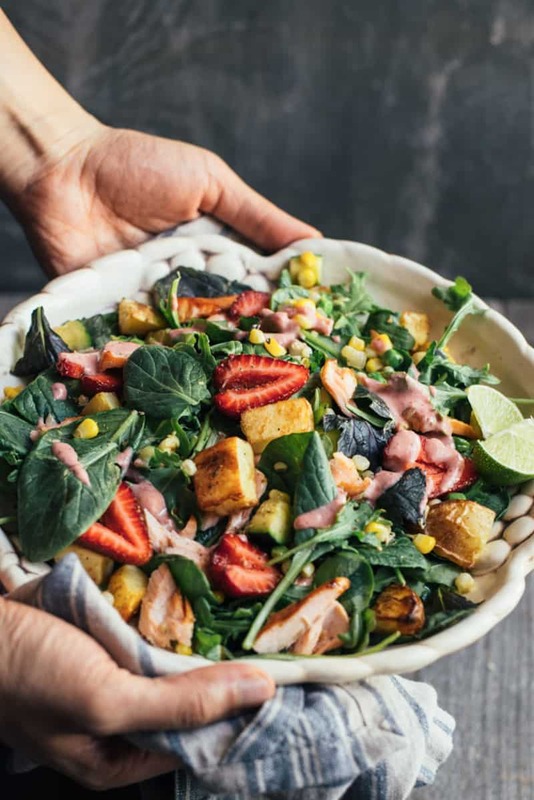 This is summery salad is filled with vegetables, roasted potatoes, teriyaki salmon pieces, and tossed with a strawberry almond dressing. It’s the perfect weeknight meal! Well, wouldn’t it be cool if I came up with some sort of guide around this? Line baking sheet for the salmon: Make sure you line your baking sheet for the salmon! The teriyaki sauce will drip to the bottom of the baking sheet and will burn. To make cleanup easier, line the baking sheet. Position oven racks to the top third and lower third slots. Preheat oven to 400ºF (205ºC). Line a baking sheet with parchment paper or a silicone mat and set aside. Toss potatoes with a tablespoon of olive oil, salt, and pepper. Spread potatoes on baking sheet and place potatoes on the upper third rack. Bake for 20-25 minutes. Season with potatoes with more salt and pepper, if desired. If you are making the teriyaki sauce, combine tamari, 1/4 cup water, mirin (if using), honey, garlic, and ginger in a saucepan. Heat over medium heat. In a small bowl, mix cornstarch with a tablespoon of water and set aside. Once the tamari mixture reaches a boil, reduce heat to medium-low and add cornstarch mixture. Let sauce simmer for an additional minute and turn off heat. Sprinkle a pinch of kosher salt on top of salmon pieces. Line a baking sheet with parchment paper or foil, and place salmon pieces on top. Brush half of the teriyaki sauce on top of salmon. Place baking sheet on lower third rack. Bake for 12 to 15 minutes, depending on the thickness of the fish. Once the fish is done, pull it out of the oven and brush more teriyaki sauce on top. Once salmon is cool enough to handle, use a fork to break it up into flakes. Heat 1 1/2 tablespoons of olive oil in a sauté pan. Add onions and cook for about 2 minutes, until the onions start to turn translucent. Add zucchini and a pinch of salt, and cook for 2 minutes. Add corn and peas and cook for another 2 minutes. Add more salt, if desired. Turn off heat. 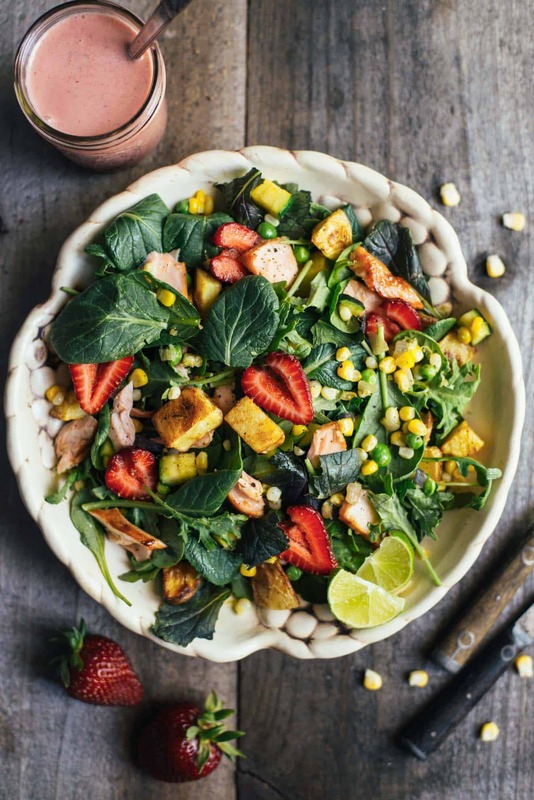 To prepare the salad, toss salad greens with potatoes, salmon, and sautéed vegetables with dressing. Serve immediately. If you want to make this salad ahead, don’t toss it with dressing. Definitely will follow this meal-planning series! And such a delicious salad too. What a great idea, Lisa! I’ve had several people tell me this as well… not sure what to make, need a list, no time to think about meal planning, etc. You’re providing a very helpful service! I know your readers will appreciate it! This salad has so much going on. It’s definitely a meal in it’s self. I love salads like that! Your sauce sounds so flavorful too! Thank you for this and your challenge! Thank you, Traci! I hope they appreciate it, too! I LOVE this idea – I’m signing up. It’d also be great if I could hire you for 45 min a night to cook it, k? 😉 I KID – 45 min? I can TOTALLY do that! 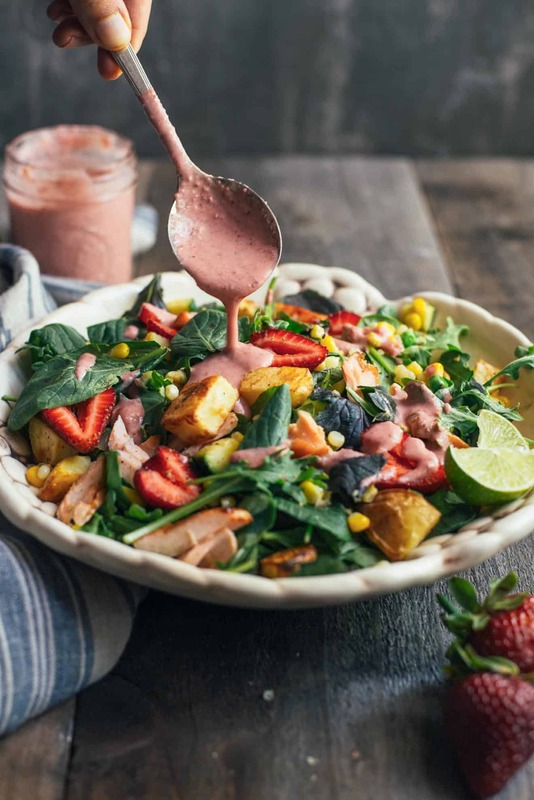 This summer salad sounds amazing – and I’m going to make it just as soon as Lucas gets back from Taiwan! what a great challenge for summer! right? 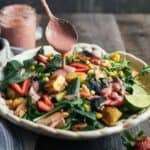 I love all flavor in these salads yet with simple ingredients ANd i could use all the cooking tips for meal planning too. Can’t wait for more friend!